SoundTube Entertainment has announced availability of in-ceiling and surface-mount speakers that operate on the Dante networking platform, including unique Master speakers that allow the connection of non-Dante speakers on the network. Four SoundTube IPD in-ceiling models and one surface-mount speaker are now available, along with two Master IPD4 speakers. Additional speaker models are slated to be added to the system in the future. SoundTube’s system not only permits individual setup of speakers, it provides proprietary 40 watts (with the SoundTube STNet Switch) per channel PoE to any STNet speaker on the system. 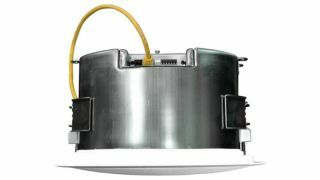 The speakers can also be connected and powered by standard PoE plus and PoE switches. The category cable which connects each SoundTube IPD speaker to the SoundTube STNet-Switch provides the signal, speaker power and report-back information; speakers are self-monitoring and report voice coil, amplifier and overheating issues. Each speaker in an STNet system can be part of a zone or can be in its own zone. Because configuration of each speaker is done through software, no re-wiring is required if the system requirements change. Further simplifying system management is SoundTube’s speaker monitoring software that can keep track of all STNet IP-capable speakers in a system. The software graphically indicates groups of speakers; if a problem occurs in a speaker within a group, the group will be highlighted on the system manager’s screen. Clicking on the group of speakers will bring up the information for the group and will identify the speaker that is having an issue. In addition to the standard IPD speaker models, SoundTube offers IPD4 Master speakers, individual Dante-enabled speakers in the STNet system which can power up to three additional non-IP speakers. Each IPD4 speaker can be broken down into 2 channels to provide a versatile, more economical solution for room coverage. IPD4 speakers are matched in a system with standard passive SoundTube speakers of the same type. All IPD4 speakers come in both an active and a passive version. SoundTube’s Dante speakers will be demonstrated on stand 3-C87 at ISE 2017.